Industry Standard Size 10" (9.75") x 2.5"
Microorganisms, i.e. Bacteria, Parasites, etc. Allows Natural Mineral ions to pass through. Ultrafiltration membranes such as this were originally designed for Medical Industry and Electronic manufacturing applications where Ultra High Purity water is crucial. Until recently these unique membranes were not available for countertop home water filters at a reasonable price. The membrane works by a hydrostatic pressure-driven process where water pushes through the tiny pores and particles larger than 0.05 micron are blocked. The pore size on this ultrafiltration membrane is an absolute (100%) 0.05 micron (thats about 4x Smaller than the smallest bacteria which is 0.2 micron) and may be used on water where microbiological issues exist. e.g. Well Water. All components comply to FDA Food Grade Quality Standards. 1. It cannot “break-through” and allow impure water to pass through. 2. It does not waste 3-7 gallons of water for every 1 gallon filtered. 3.It is much more affordable & lasts for approximately 3 years. 4.It allows for crucial natural minerals to pass through. 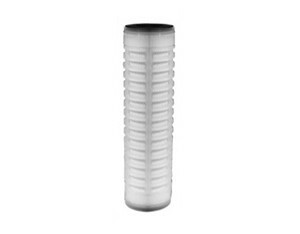 5.It Does not require a water storage tank & fits any standard 10” filter. Fully submerge the membrane into 3-5% Hydrogen Peroxide liquid every 3 months for a period of 12 hours. In 12 hours remove the membrane and rinse under warm water, then install it back into your system. Flush the system with cold water for 5 minutes before use.